Tonight I made a recipe that I had seen on Real Thai Recipes. Chicken is stir-fried with lots of garlic (yes, please! ), white pepper, and fish sauce. 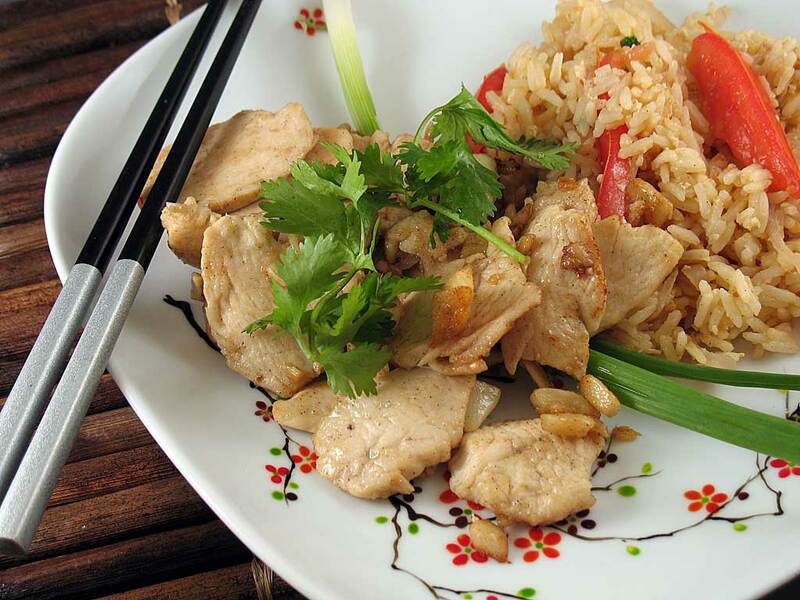 To accompany the chicken I made a Thai Fried Rice based on a few different recipes online. The garlic in this is so good! Why is it so spicy? Is it? Doesn’t seem that way to me, there aren’t any hot chilies or anything… just pepper. It’s delicious, but yeah, seems spicy to me. Maybe I’m not used to white pepper… hey, what the? I’m investigating by eating off your plate. Add vegetable oil to pan over medium-high heat. When oil is just about smoking, add in garlic and stir-fry until lightly browned. Add in chicken and stir-fry until chicken is fully cooked and starts to brown. If chicken starts to stick to pan, add a little water. Add in fish sauce, sugar, and white pepper, and stir until well blended, adding water if necessary. Serve immediately. Heat the oil in a wok over high heat until it’s almost smoking. Add the garlic until lightly browned, then add the shallots and stir-fry for a minute. Add in the egg whites and stir until egg is cooked through. Add in the rice, and stir in the remaining ingredients until warmed and well blended. Adjust spices to your liking.